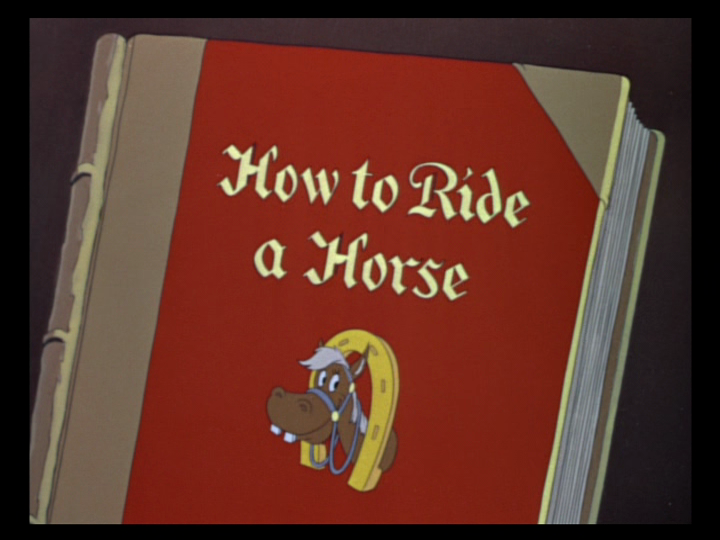 On February 24, 1950, the Goofy short film, How to Ride a Horse was released to theaters. It was originally released as a segment within the 1941 film The Reluctant Dragon. Along with the other cartoon segments in the original film, it was directed by Hamilton Luske. The short begins with the narrator introducing the basics of riding, including the benefits of the exercise. Goofy then introduces the proper riding attire, complete with conservative hat, comfortable boots, and a nice riding coat costing $4.98. The horse is then presented, and listens to the narrator’s praise with glee – that is, until the narrator calls him a dumb animal. Goofy then approaches the horse for his ride, but the horse quickly takes the lead of the situation, tripping Goofy and sending him flying into the dirt. Goofy tries to bribe the horse with carrots, and nearly gets his arm bitten off. The horse manages to steal all of Goofy’s carrots, and his long underwear to boot. Next, Goofy tries to mount the horse, but the horse would rather trip and trick Goofy than agree to be mounted. When the narrator tries to explain mounting the horse via the stirrups, both Goofy and the horse are bored to sleep. In the long run, Goofy is able to mount his horse. The narrator then moves to the mechanics of riding, starting with the trot, brought down to slow motion to show the “majesty” of the movement. Afterwards, when it comes to jumping, the horse refuses to go. When Goofy tries to use his spurs, the horse jumps away, leaving Goofy to use the spurs accidentally on himself. The horse then gallops around happily, jumping on top of Goofy. In the end, Goofy and horse are one riding around the countryside, although they are forced to try again when the jump fails. At the end of the day, the two drag themselves back from their ride, but the horse heads in excitedly when he finds out that they’re heading straight for the stable, and crashes Goofy into the door. Posted in Uncategorized and tagged 1950s, Color, Feature Film, Goofy, Short film. Bookmark the permalink.